Thousands of prison workers have begun a 24-hour strike from Friday over a long-running pay dispute. Industrial and agricultural staff are taking action over a 1% pay rise for 2003 imposed by the Prison Service. It is the first strike by industrial workers - who provide gas, electricity, cooking and other services - in the past 25 years. The leader of one trade union involved, Ucatt, said the staff were "sick and tired of being undervalued". Prison officers received a higher settlement that year. The action, in England and Wales, began at 0600 BST on Friday. Industrial staff felt they had been treated inequitably for too long, said John Allot of Amicus, which is the largest union involved, representing 1,500 prison workers. "All our members are asking for is fairness and a decent living wage. Our members are taking this action with regret but this is the only choice they have to get their voice heard." 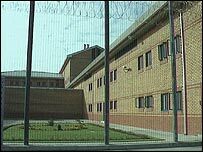 George Brumwell, general secretary of construction union Ucatt, which has several hundred workers in the Prison Service, said their members were "highly skilled craft workers who undertake their work in stressful and potentially dangerous conditions". He called the 1% pay offer "derisory and insulting", adding that further action could not be ruled out. The GMB and TGWU unions also represent people in the sector.